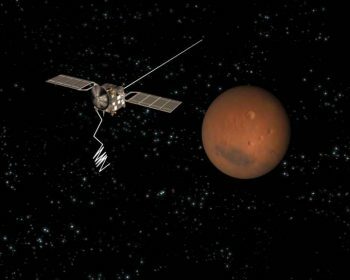 In 2004, a year after Europe’s first mission to Mars was launched, the flight dynamics team at ESA’s operations centre encountered a serious problem. 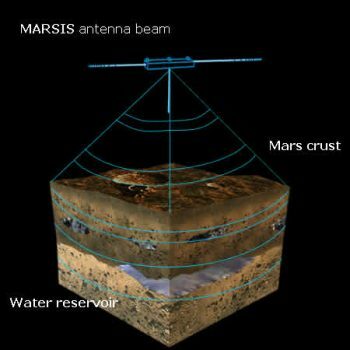 New computer models showed a worrying fate for the Mars Express spacecraft if mission controllers continued with their plans to deploy its giant MARSIS (Mars Advanced Radar for Subsurface and Ionosphere Sounding) radar. This extremely sensitive radar instrument spans 40 metres across once fully extended, making it longer than a Space Shuttle orbiter and was built with the direct intention of finding water beneath Mars’ surface. By sending out a series of chips between 1.8 and 5.0 Mhz in ‘subsurface’ mode would scour the red planet for any signs of water anywhere down to a depth of a few kilometres. A secondary ‘ionosphere’ mode at 0.1 to 5.4 Mhz surveyed the electrical conductivity of the Martian upper atmosphere. Two ‘radar booms’, 20-metre long hollow cylinders, 2.5 centimetres in diameter, and one 7-metre boom, were folded up in a box like a concertina. Once the box was opened, all of the stored elastic energy from the glass fibre booms would be released, a little like a jack-in-the-box, and they would lock into a straight line. 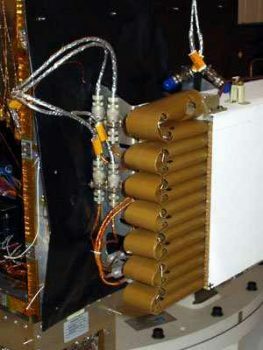 New and updated computer models, however, showed that these long rods would swing back and forth upon release with an even greater amplitude than previously thought, potentially coming into close contact with the delicate parts of the Mars Express body. Plans were made to get the spacecraft in a ‘robust’ mode before the deployment of each boom and while the glass fibre cylinders were extended. After each deployment the control team would conduct a full assessment of the spacecraft, taking up to a few days, before moving onto the next phase. The first deployment began on 4 May 2005 with one of the two 20-metre ‘dipole’ booms, and flight controllers at ESA’s operations centre quickly realised something wasn’t quite right. 12 out of 13 of the boom segments had ‘snapped’ into place, but one, possibly number 10, was not in position. Further analysis showed that prolonged storage in the cold conditions of outer space had affected the fibreglass and Kevlar material of the boom. What could be done to heat it up? MARSIS boom 2 deployment begins. Credit: ESA, CC BY-SA 3.0 IGO. Enter: the Sun. Mission teams decided to swing the 680 kg spacecraft to a position that would allow the Sun to heat the cold side of the boom. It was hoped that as the cold side expanded in the heat, the unlocked segment would be forced into place. One hour later, as contact was reestablished at 04:50 CET on 11 May, detailed analysis showed all segments had successfully locked in place and Boom 1 was successfully deployed! Following the rollercoaster rollout of the first antenna, flight controllers spent some time mulling over the events. A full investigation ensued, lessons were learnt, and plans were put in place to prevent the same irregularity from taking place in the next two deployments. By 14 June 2005, operators felt confident that they, and Mars Express, were ready to deploy the second boom. At 13:30 CEST the commands were sent. 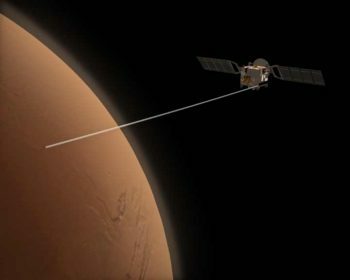 This time, Mars Express was set into a slow rotation to last 30 minutes during and after the release of the second 20-metre boom. The rotation was planned so that all of the boom’s hinges would be properly heated by the Sun before, during, and after deployment. Just three hours later and the first signs of success reached ground control, showing that Mars Express had properly re-oriented itself and was pointing towards Earth, transmitting data. The data confirmed that the spacecraft was working with two fully and correctly deployed booms, and their deployment had not caused any damage to the spacecraft. 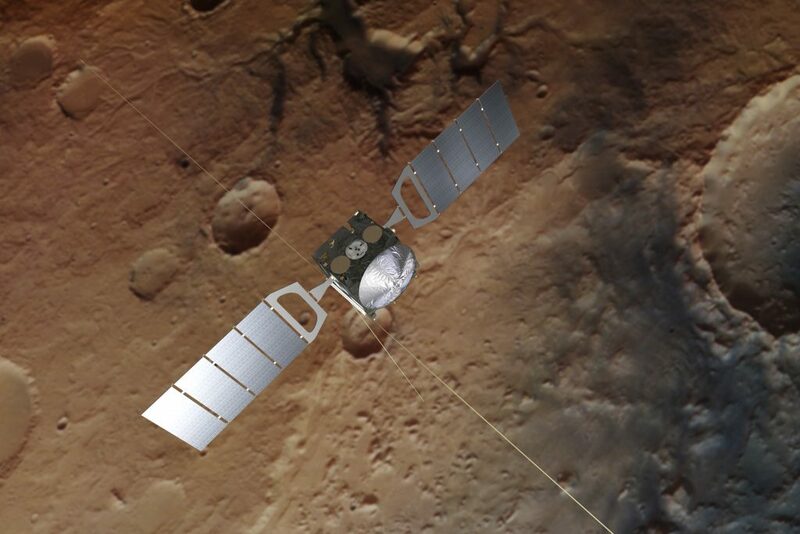 Not long after, the third boom was deployed, and the full MARSIS setup was complete on Mars Express. Just four months later, and ESA was reporting on the radar’s activities. MARSIS radar scientists were collecting data about a highly electrically conducting layer – surveyed in sunlight. They were also continuing the laborious analysis of data in the search for any possible signs of underground water, in a frozen or liquid state. Radar science is based on the detection of radio waves, reflected at the boundaries between different materials. Each material interacts with light in a different way, so as the radio wave crosses the boundary between different layers of material, an echo is generated that carries a sort of ‘fingerprint’, providing information about the kind of material causing the reflection, including clues to its composition and physical state. Like Earth, Mars has two ice caps covering its poles, and early attempts to measure the composition of these regions suggested the northern cap could be composed of water ice, while the southern cap is made up of carbon dioxide ice. 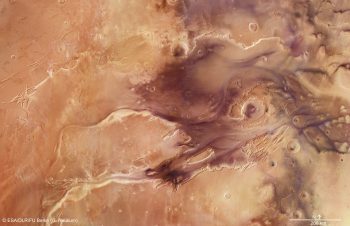 Later observations by the OMEGA instrument on board Mars Express suggested the southern cap was in fact composed of a mixture of carbon dioxide and water. 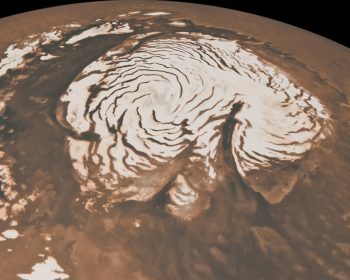 However, it was only with the arrival of Mars Express that scientists were able to obtain direct confirmation for the first time that water ice is present at the south pole. MARSIS, the first radar sounder ever sent to orbit another planet, revealed that both polar ice caps are up to 3.5 km thick, each with a core of water ice that is covered by a layer of carbon dioxide ice, centimetres to decimetres thick. 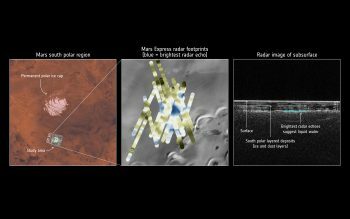 On 25 July 2018, fifteen years after its launch, it was confirmed that data from years of Mars Express’ observations were telling us something remarkable. Hidden beneath Mars’ south pole is a pond of liquid water, buried under layers of ice and dust. 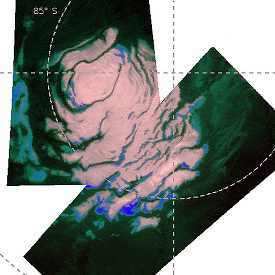 The presence of liquid water at the base of the polar ice caps had long been suspected, but until now evidence from MARSIS had remained inconclusive. It has taken the persistence of scientists working with this subsurface-probing instrument over years, developing new techniques in order to collect as much high-resolution data as possible to confirm such an exciting conclusion. Liquid water cannot survive on the surface of Mars, as the low atmospheric pressure causes it to evaporate in a matter of hours. But this has not always been the case. Evidence for the Red Planet’s watery past is prevalent across its surface in the form of vast dried-out river valley networks and gigantic outflow channels clearly imaged by orbiting spacecraft. Orbiters, together with landers and rovers exploring the martian surface, also discovered minerals that can only form in the presence of liquid water. Over the course of the Red Planet’s 4.6 billion year history, its climate has vastly changed, meaning scientists today have to look for water underground. 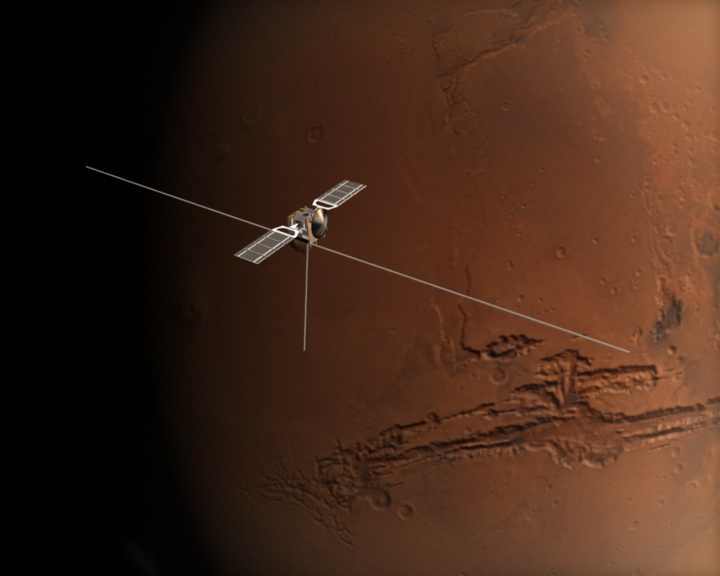 We now know for certain that under its surface Mars harbours ancient masses of liquid water. Kept in a liquid state by the vast pressures from glaciers above, it is thought that this water is also a briny solution. The presence of salts on Mars could further reduce the melting point of water, keeping it liquid even at below-freezing temperatures. So congratulations to everyone involved in this incredible discovery, and thank you to the flight controllers at ESA’s operations centre in Darmstadt whose dedication and ingenuity 14 years ago made possible what we know today.